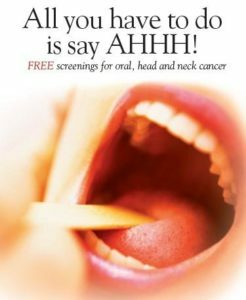 Participants will receive information of oral, head, and neck cancer, how to do a monthly oral exam. Participants will be screened by local Head and Neck Physicians or Dental Hygienist. The screening consists of a painless and non-invasive 5-10 min exam of the mouth head and neck area. Participants with concerns will be referred to.